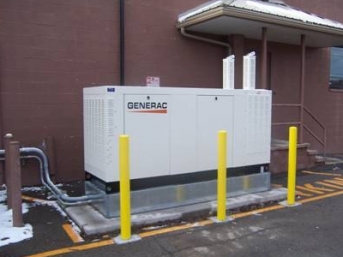 1) Installation of an 80kw, Generac three phase generator for First Allied in Rochester, NY. 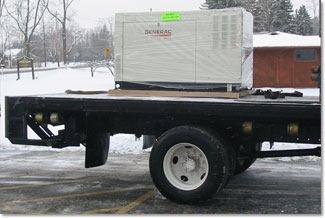 Customer has issues with flooding and requested our Commercial Power Systems division to design a solution to raise the generator 14" off the ground. Steel bollards were installed to protect the generator from vehicle traffic. 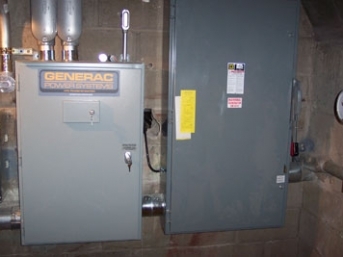 This is a whole building backup solution with a Generac 800amp transfer switch. 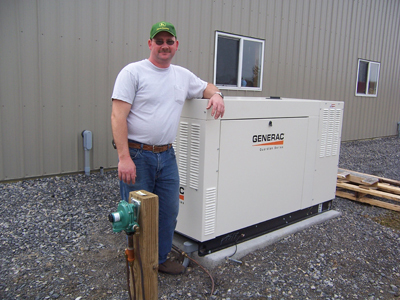 2) Installation of a 60kw, 3-phase generator at Lake Beverages in Henrietta, NY by our Commercial Power Systems Division. 3) Installation of a 60kw, three phase generator for Employee Relations in Rochester, NY. This solution provides whole building transfer. 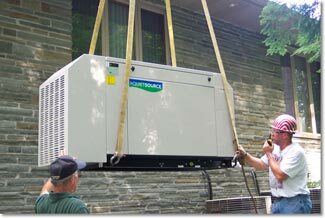 4) Electrical installation of a QuietSource generator. 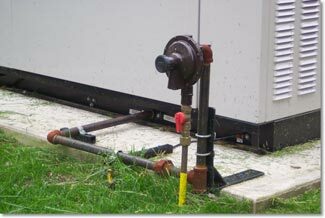 Notice two separate conduits, 1 for controls and 1 for power feed to transfer switch from generator. 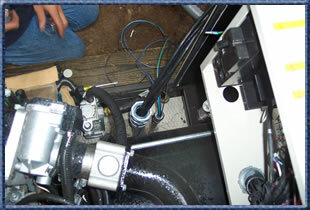 All electrical terminations are inside the enclosure. 5) A 30kw model QT03016 installed. Clean, neat installation. 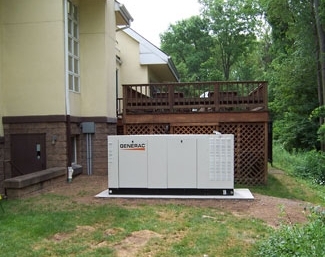 6) 30kw Generac installed on very steep hill. This foundation and structure is not only secure but is pleasing to look at. This is not going anywhere! 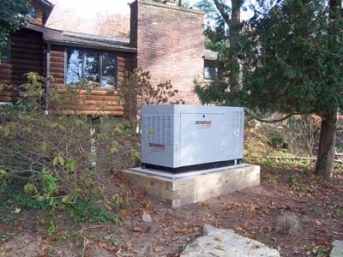 7) 45kw single phase QT04524 installed in Skaneateles, NY. Another happy Home Power Systems customer. 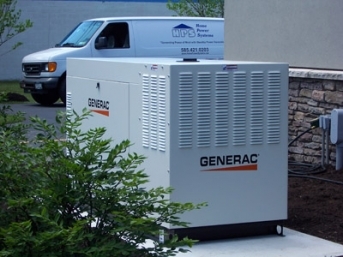 8) Home Power Systems professional installation of a residential generator. We use a crane to install your generator when site conditions warrant this. 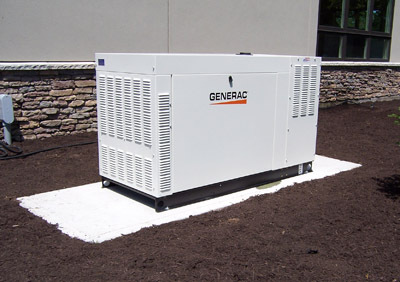 9) The low profile structure of Generac's 60kw generators offer plenty of power in a compact enclosure. 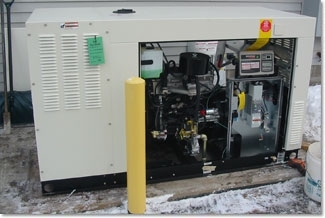 10) This is an installation of a 45kw generator at Penfield Ambulance. 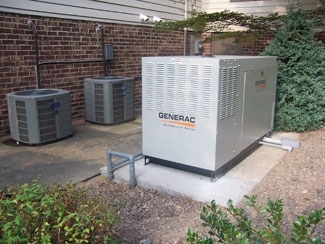 This was a replacement for an old Onan generator that no longer worked. 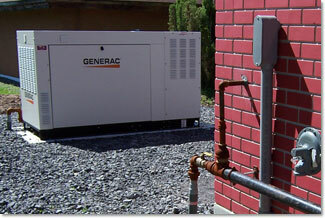 11) A 100kw generator install for Ronald McDonald House. Notice the new models do not have exhaust stacks...clean looking generator! 12) Residential installation of a 45kw generator. 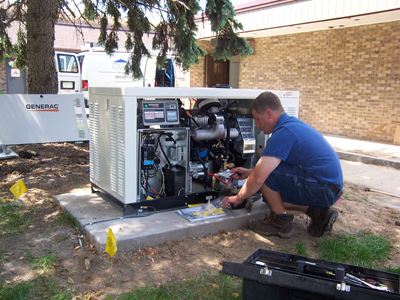 Even residential natural gas services need to be upgraded to support a larger generator installation. 13) Delivery of new 30kw QT03016 Penfield Ambulance. 14) Professionally installed using a 110' boom to crane over a residential property. The home owner was very surprised how fast this process took. 15) Lowering in place. Radio communication to the crane operator from the rigging foreman. 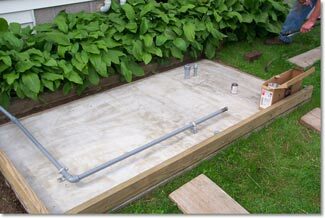 16) Concrete pad ready to accept 25kw liquid cooled generator. Notice the electrical conduits stubbed up on upper right side and the gas piping exposed on the slab. 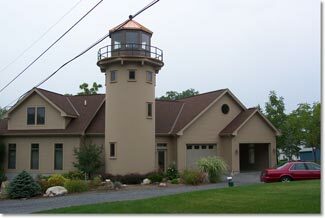 17) A liquid cooled standby generator was installed at this home to keep the midnight candle (lighthouse) burning. Everybody has a reason for a generator...I like this one! 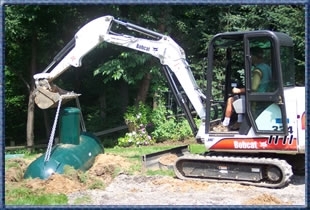 18) 500 gallon, underground, liquid propane tank installation. 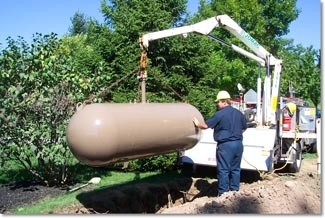 19) Installation of an underground 500 gallon liquid vapor propane tank. 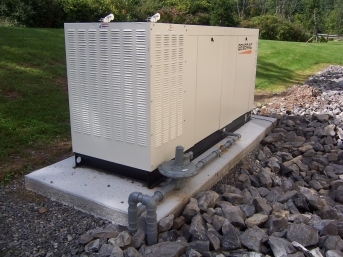 This install was for a fuel source for a 35 kW QuietSource generator. Projected run time under full load is seven days. 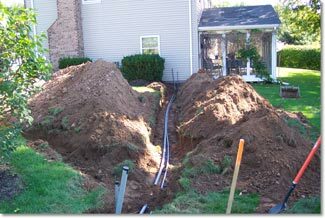 20) Underground PVC electrical conduit install from generator to home. 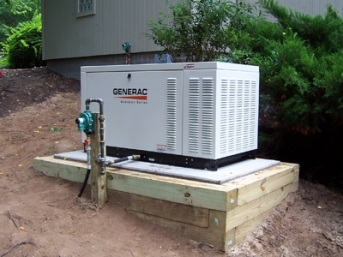 21) Liquid vapor propane, final connection, to a QT generator. This is what a professional installation looks like. 23) 48kw QuietSource install for a residential home. 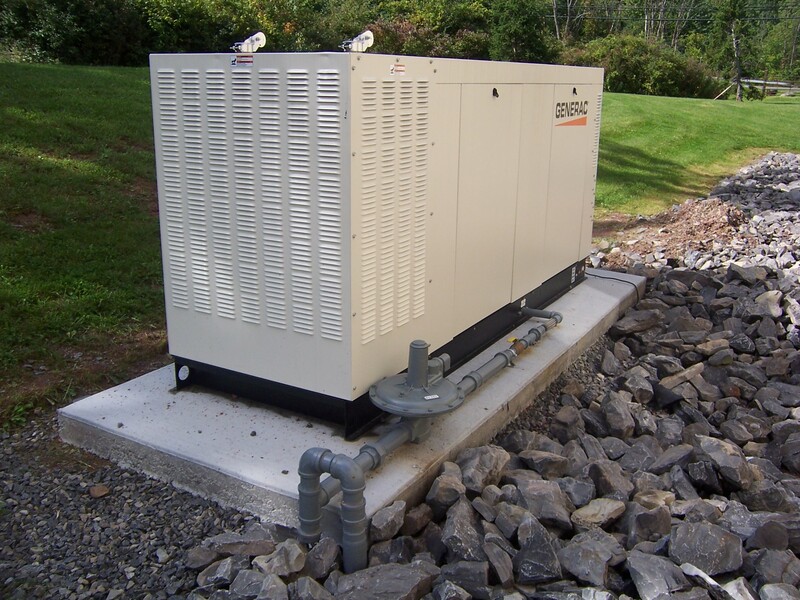 24) 100kw QT10068 install for Thompson and Johnson in Syracuse. 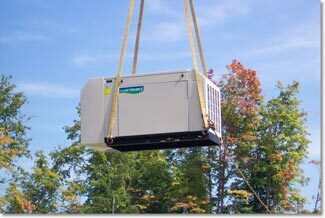 This is a whole building transfer solution engineered and designed by Commercial Power Systems. 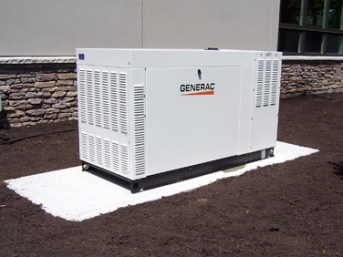 25) This is Generac's new 7kw "Core Power" generator. It comes with an 8-circuit transfer switch. Great solution for just the basics. 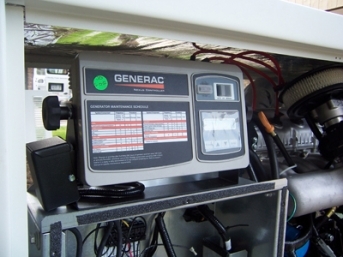 26) HTS, 400amp, 3-phase, 120/208v Generac transfer switch. 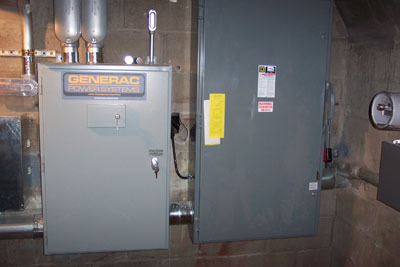 On the right is a 400amp fused safety switch which provides overcurrent protection to the transfer switch. This is a typical installation. 27) New Generac 48kw generator QT04842 installed in Victor, NY. Again, the foundation is solid and looks great in this setting.